Apothecary Shoppe specializes in certified organic tools and supplies for wellness including therapeutic-grade essential oils and botanicals, DIY and reference books, and a wide selection of DIY how-to kits, raw ingredients and accessories. The Apothecary Shoppe is an Oregon Tilth Certified Organic Facility with a commitment to sustainable practices and principles. 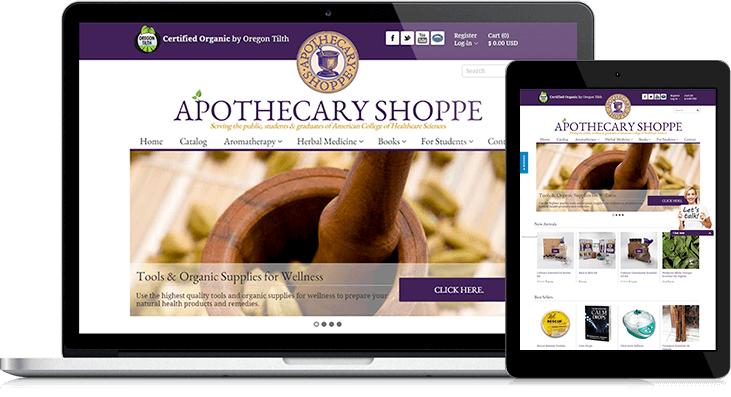 The American College of Healthcare Sciences came to us needing an update to their Apothecary Shoppe ecommerce store. We migrated the Apothecary from their outdated ecommerce platform to Shopify and set them up with a customized responsive template that looks gorgeous on both desktop and mobile devices. They are now able to offer their customers a great shopping experience with a live char, coupon codes, and upsell opprotunities.